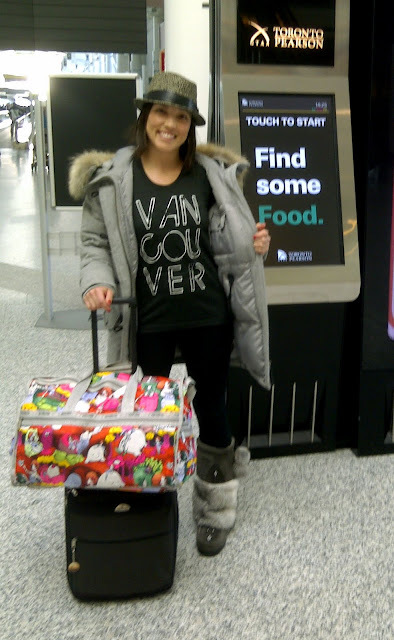 Dancer/Choreographer Kelly Konno Loves Vancouver! Vancouver, we love you [the t-shirt project] has a lot of great supporters, including dancer/choreographer/actress Kelly Konno. Kelly has an impressive resume, dancing with superstars such as Justin Timberlake, Janet Jackson, Michael Jackson and more. She recently was a choreographer and coach on Canada Sings which premieres August 3rd on Global! Check out Kelly wearing her love for Vancouver at Toronto's Pearson Airport while in Toronto taping the show. What does Kelly loves about Vancouver? "English Bay or Kits during sunset in the summer. In the winter, sitting on a chairlift on one of the local mountains and overlooking downtown, or driving back on a sunny day from Whistler on the sea to sky highway. Amazing." Show us your favorite spot in Vancouver. Email us a photo of yourself wearing your Vancouver, we love you shirt to post right here!